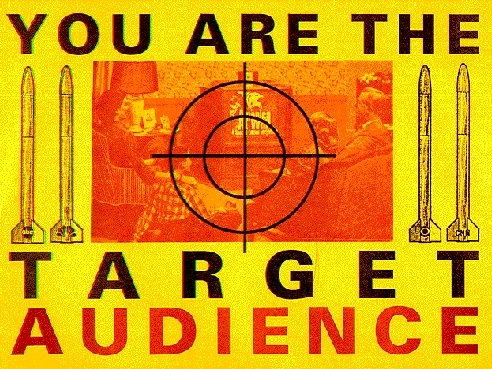 The Arch D. Bunker posters (Persian Gulf War "Target Audience" here), featured over the next few pages, were the work of a loosely affiliated band of San Francisco radicals during the anti-war agitation. There are many wars being fought in the Middle East The war of torn and bleeding bodies. The war of Pentagon analysis. The war of media dramatization. Like most Americans, we are privy only to the electronic spectacle of war, safely distanced from the horrific screams and severed limbs. This is the war brought to us by the Network News. When you watch the News, you are invited to enter into a pact. You are expected to believe in the same system, share the same values and goals. The broadcasters promise to reinforce your beliefs, if you promise to rely on them. Under the terms of this pact the News pretends to press the government for answers. "Surgical Strike," "Collateral Damage," "Carpet Bombing," "Friendly Fire": The TV viewer is fed the new vocabulary of war. Familiar catch phrases--their meaning depleted by repetition--make reports of war palatable, and insure audience retention. These vacant terms only masquerade as information. The frightening reality is replaced by a lullaby of empty cliches. Using selected images, TV News pretends to transport you to the heart of the action, creating the dizzy sensation that you can be anywhere, informed and powerful, an active player in global politics--while you 're sitting at home safe and going nowhere. The cheapest version of reality is the one that relies on charts and maps. It presents knowledge not as understanding, but as volume. Under the gaze of the News, quantity vanquishes quality. Because quality attests to the presence of surprise, of emotion, of suffering. To protect us from the unpredictable, the News delivers war as a factor of inventory depleted. But where there are only numbers, there is no quality of life. By second-guessing public opinion, broadcasters can tailor-fit the news to taste. What better way to see the world than as a reflection of your own views. But polls measure something other than opinion--they measure the degree to which the public has forfeited its democratic participation. Parading out the experts is a two-fold diversion. Initiation into the technical details of a specialty, in this case warfare, is a method of producing a false sense of privilege. It is also a way of masking the absence of real news. Generals (ret.) command a rhetorical skill that quickly fills dead air time--it's known as generalization. Like any theatrical presentation, the news thrives on conflict. Often the News will help the process along, stirring controversy, fabricating hostility. Pinpointing the enemy, the Them against Us, is basic to this drama. The enemy can be an oil spill, an Iraqi civilian, an anti-war activist anything that generates tension. Only the News and its vested interests are above suspicion. To protect itself from criticism, the News indulges in its own analysis, admitting the small error to hide the greater sin. The News might publicly examine the fact that it airs only Pentagon-approved footage, or offer a forum about its own frustration with censorship. The military calls this a preemptive strike.